Listening to waves gently lap the shore while birds chirp together in chorus, it’s hard to believe I’m on an island famous for its all-night dance parties and celebrity DJs. 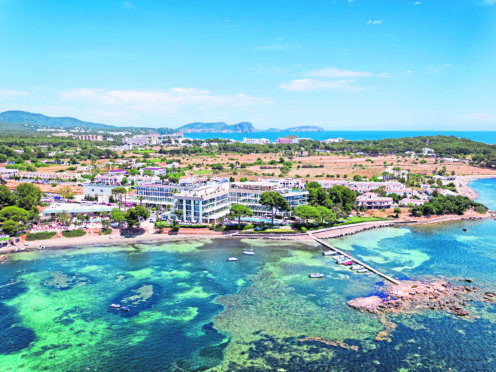 Ibiza may be a small island, with our base in Santa Euralia just a 30-minute drive from buzzing party centre San Antonio, but the two areas are worlds apart when it comes to holiday vibes. Santa Eularia is a calm paradise. Santa Eularia des Riu on the eastern coast is a calm paradise with a quiet, slow pace of life. There are beautiful beaches – including the first smoke-free one in the Balearic Islands – great food and plenty on offer for those after a more serene break. The island does phenomenally well from party tourism, and undoubtedly revels in attracting huge names, including DJs David Guetta, Martin Garrix and Steve Aoki, but residents are keen to show off its lesser-seen beauty and family-friendly activities. Although the municipality – second only to Ibiza Town in terms of population – has long catered for families, it is now actively encouraging local hotels and restaurants to sign up to its Family Moments initiative. The seal is an official marker given to establishments that meet specific criteria – such as kids’ clubs, babysitting services and family pools – making them ideally suited to host children on a family holiday. Santa Eulalia is home to the only river in the Balearic Islands, and a walk along the signposted 3km river route is a delightful way to while away an afternoon. A starting point at the 16th-Century fortified Puig de Missa church gives spectacular views of the town, and a leisurely downhill stroll from there brings you to the Can Planetes Mill, a centre explaining the importance of the river to locals in bygone days. Fuelling up for walking tours can be an activity in itself at Maria Colomar’s eco farm Can Muson. Breakfast here is sure to delight young children, especially those from towns and cities. As well as walking through the rows of fresh lettuce and strawberries growing on the 65,000 square metre farm, young visitors can feed animals from superhero-themed beach buckets filled with an array of snacks. “They are in contact with nature and the animals here. Many of the children haven’t seen a goat or a pig before,” says Maria. Local produce is available to buy on site, and the food on offer at the small, outdoor restaurant is either organic or made up of ingredients grown on the farm. It’s a far cry from the hedonistic reputation Ibiza has enjoyed for so many years, but according to tour guide Shana Lacroix, there’s enough room on the island for everyone. 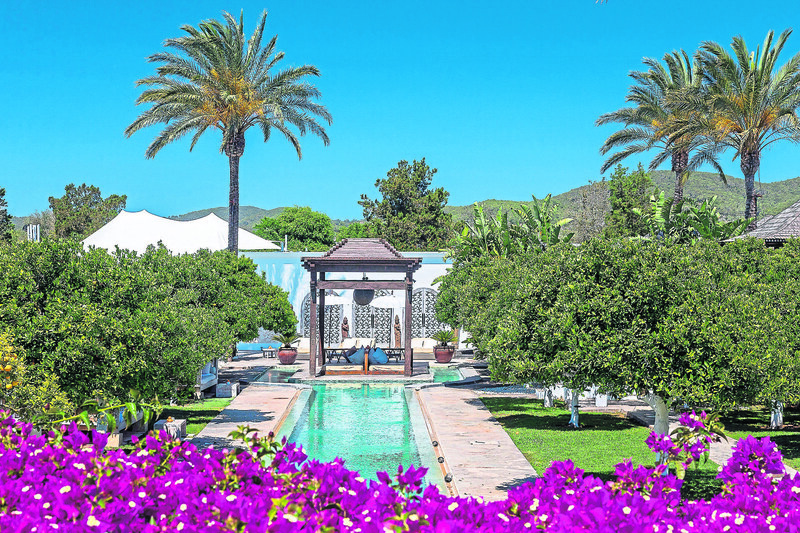 This three-star complex in Playa Es Figueral is around 10km from Santa Eulalia. The hotels sit on a sprawling site along the coast, giving magnificent sea views and easy access to the beach, with ramps installed for buggies. Probably best-suited to a family wanting an all-inclusive holiday, the hotels offer poolside entertainment for children, as well as tennis courts, football and hockey grounds. The piece de resistance has to be Pirate Island, complete with slides and a huge bucket that every so often dramatically dumps water into the pool. Three kids’ clubs cater separately for age groups between three and 17. Suites can sleep up to six people, with the top-priced ones offering a private balcony. Past ravers now settled into parental life are likely to enjoy this funky, modern hotel. The pink-lit reception, artistic wall installation and afternoon DJ by the pool give ME Ibiza a fun but chilled vibe. An open-plan lobby allows guests a view of the pool area from the moment they arrive. Rooms vary in size, but all are ultra-cool. White, synonymous with Ibiza, is a common colour – from staff clothing to room features. While children can enjoy the kids’ club and a child-friendly pool, adults can lounge on the Bali beds by the main pool. Breakfast features everything from cereals and breads to doughnuts and champagne. This exclusive Balinese-inspired spa hotel, surrounded by orange trees, is the epitome of utter relaxation. Out in the peaceful calm of the countryside, guests can switch off as they sprawl on four-poster daybeds by a long, narrow pool. Whether you’re sipping from a coconut or lounging by the huge LOVE letters at the edge of the pool for the perfect Instagram shot, this place is perfect. Past guests include Hips Don’t Lie singer Shakira, although staff, presumably wanting to maintain privacy, remain tight-lipped on other celebrity clientele. Remarkably, the hotel does welcome children. The spa is adults-only but a separate family-friendly pool ensures parents and children can relax together. A nanny service is available.